No experience with diving lights. 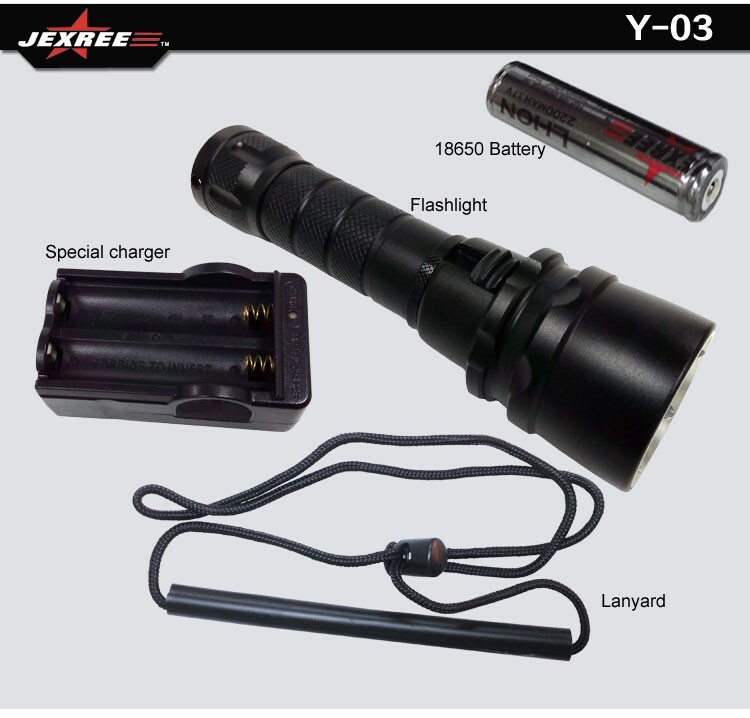 Need a light for random use no high power required at moment. Does a plastic body light can be an alternative ? There are many similar models,some looks with bad hollow pill and a sort of TIR lens,others with reflector like a p60 host, on/off rotary switch or use a lever. Wich of them are the best quality and advice name seller? I’d save up for something better with a 18650. You’re right about the aluminum corrosion in salt water though. often they don’t know what they have! what about the swith of your light? Anodization does not sufficent to prevent corrosion? Does a piece of zinc work like a sacrifical anode? The one i linked (i don’t own one) has a slider with a magnet, the sensor is inside the light. That can not leak water. do you think this type of switch will be durable? Those little green plastic lights are highly variable, even from the same site. They have different LED’s, different drivers, and different modes. Some work OK, some overheat. In a way the dimmer ones are better and less likely to overheat. They seem to go into blink-mode when they do that, at least mine do. The main body is 2 halves plastic welded (?) together. There may be a small ridge in the O-ring channel from the process, which is common. This may make it leak if used for real diving. You need to clean that up with #2000 wet and dry sandpaper. Then, get better O-rings, which are also quite variable. They tend to come with crappy ones. Once sufficiently ‘cleaned up’ I have used them on entire scuba trips with regular use satisfactorily. If you don’t do the fixes, they are liable to leak. luck of the draw on that one. Frankly I wouldn’t bother with any dive light that corrodes if you actually want to dive with it. Why bother? There are fine lights that will not. The ONLY reason I worked with the tiny yellow/green plastic lights is because they are so cheap, very tiny so good for travel and the increasing weight restrictions, and adequate for lighting on tropical trips where lighting is not nearly as critical. Decent equipment in diving is important. do you know name of sellers that have good quality plastic lights on 5~usd range? But I can’t guarantee anything about the light other than cheap. Like I said, their are simply too many variables. I have 4 of them and everyone is different. this is model with rotary switch,safe to move on/off underwater? looking inside a metal tube for battery contact,can be removed for put a 3aaa holder? Not familiar with that model. I love the UltraFire DV-S9. Magnetic slider on the side, so zero potential for leakage from the switch. Yeah, it’s a HA Al body, so might corrode if you scratch the finish, but what about giving it a light coating of “plasti-dip”, “liquid electrical-tape”, etc.? Sure, you’ll be bottling up the heat somewhat, but if it’s underwater, contact even through a thin layer of “rubber” is way better than open-air. I’m still not understanding the method of corrosion, if the head + tailcap + tube are all electrically connected, and there should be zero potential between any two points on the connected-metal. If you try a tailcap-lockout by unscrewing the tail a quarter-turn or so, then sure, there’s the battery potential between the tailcap and the tube where the contact is broken. But if it’s all connected?!? ScubaPro is a good choice, this dive light is built like a tank… love it and would recomend it. nice to know about the cheapest lights after reading the advices, thanks for comments. 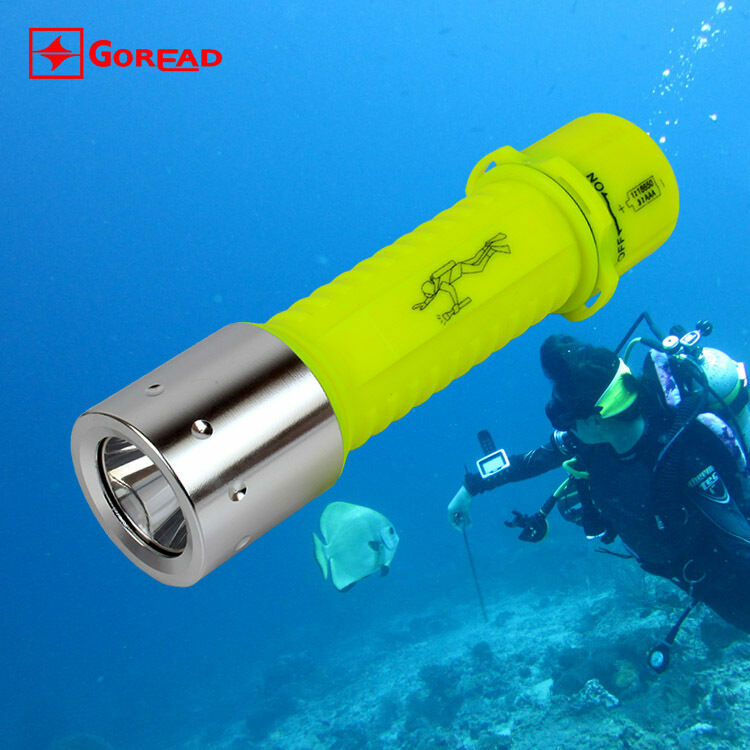 Cheap plastic yellow flashlight is always with me on night dives. But! Only as a spare in the pocket of my BCD. By the way, I put an UV LED in the same flashlight for the experiment. Some corals glow beautifully in the ultraviolet. I also need to find a good diving light. 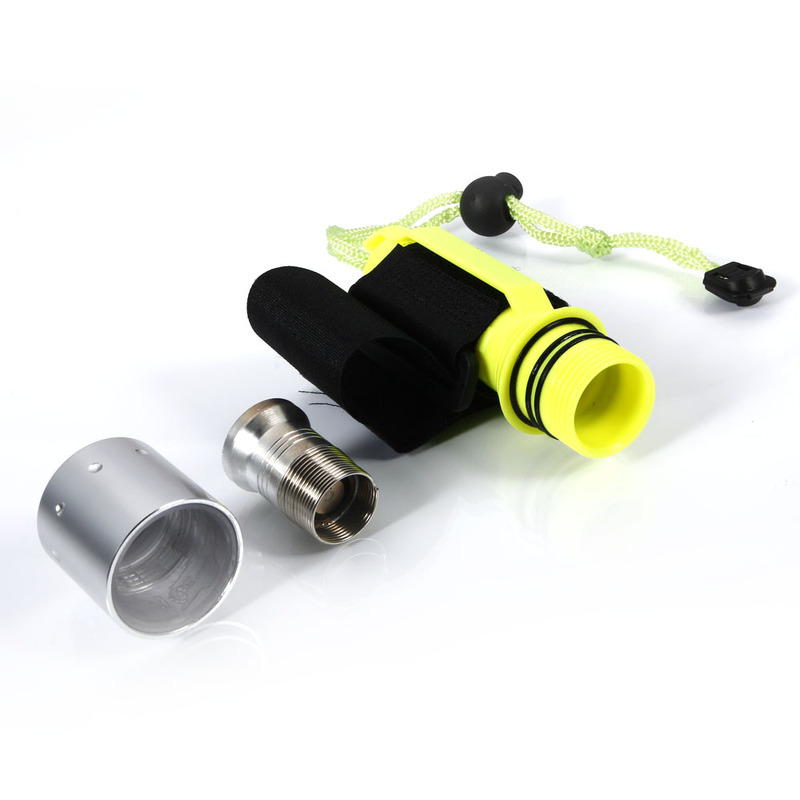 The entire point of a dive light is for it to withstand high pressures without water ingress. How do you think a piece of plastic will do?? The amount of pressure on it will compress it even at shallow depths. I get your point about plastic, especially associate with cheap + dive light, but it’s not a complete truth. Several major manufacturers of top end dive lights (Underwater Kinetics, Princetontec to name a couple) have done a remarkable business of making good, reliable lights out of plastic. I used UK dive lights as my primary for over a decade. My backup for the last 6-7 years has been a UK. That means I trust it to be there when and if I need it. Some of the horrible dive lights coming out of China are metal, aluminum usually. So…metal is not necessarily the answer. The real issue is the quality of the light in the first place. It’s a challenge to be super cheap, AND have reasonable function, AND still be operationally reliable. After that it’s the support of the manufacturer. Very old topic, but still relevant IMHO. An all plastic housing does not necessarily mean pool use only, but yes there are some real cheapies that wouldn’t last long below 10 feet. When I used to dive before LED light technology was good enough and affordable enough to use, all lights I’d see in use had plastic bodies, but made of thick ABS. I suggest visiting a SCUBA forum, in their equipment sub section. Lights would definitely be a discussed topic with recommendations.